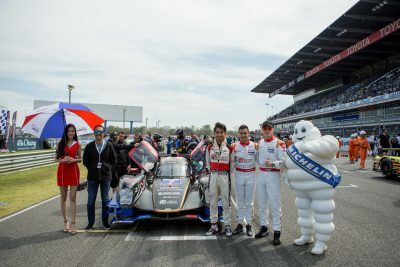 Michelin, a sponsor of the ASIAN LE MANS SERIES sports car endurance competition, highlighted its commitment to Motorsports as the sole tyre supplier for the event since 2010. Launched in 2013 by the Automobile Club de l’Ouest (ACO), the Asian Le Mans Series is the embodiment of Le Mans endurance racing for the Asian continent. Initially operated by a third party company, the ACO took over management, organization and promotion of the Series at the end of 2014. Since then the series has gone from strength to strength. This season the winning race teams of the LMP2, LMP3 and GT classes will be an automatic berth to compete in the 24 Hours of Le Mans held in France, which is regarded as the most prestigious race of its kind based on its rich history as the oldest and most iconic endurance race. it is a dream for all race drivers to qualify and participate in this endurance race competition. Michelin, with its global status as the leader in tyre technology, has continually supported motorsports competitions, which provide Michelin the opportunity to collect important data of tyre usage from each competition. Since every race presents different conditions, all data has been brought for analyzing to further develop better tire products to serve the customers with different needs globally. The Asian Le Mans Series 2017/2018 will be made up of 4 race categories: LMP2 , LMP3 , GT and GT Cup; the 1st competition was held at Zhuhai International Circuit, China followed by the 2nd race at Fuji Speedway of Oyama, Japan in 2017, and continued in 2018 with the 3rd race at Chang International Circuit, Buriram, Thailand and will complete the series with the final race at Sepang International Circuit in Selangor, Malaysia. Michelin supports each Asian Le Mans competition with over 400 tyres or up to 6 sets of tyres per team in a race consisting of Slick S9L hard compound for dry road condition and P2L intermediate wet tread pattern for wet surface. The racer’s goals and objectives for every race course remain unchanged – that is, to win the automatic berths to compete in the 24 Hours Le Mans in France. Simply put, the 24 Hours of Le Mans is the pinnacle of automobile endurance race competition whereby legends of motorsports have made their mark and created legacies for motorsports fans all over the world. Michelin will continue its mission to develop the latest technologies from the learnings of various challenges experienced in every competition. The data collected will allow us to offer new and improved tyres that meet customers’ discerning requirements to navigate all types of terrain, climate and condition for both race environments and everyday usage by motorists all over the world.